Football Manager is a game which has changed all of our lives, for better or for worse. It has become an obsession which has captivated thousands of players year-after-year, offering no feasible avenue of conceding defeat to enjoyment of real life. Whether we would like to admit it or not, this simulation game has become a major part of the lives of this site's members, and many of its regular browsers. A number of those afflicted with Football Manager addiction have turned to graphic design for the game, while others have chosen to spend their time creating, or modifying, databases to redevelop an already imaginary world, and the self-proclaimed masters of the game have shared their tactical work for others to use. But, the only people we are concerned about now are those who choose to share their epic conquests of Football Manager with the world. This article will offer guidelines and assistance to those who wish to display their FM adventures with the people of fmscout.com. For many story writers, the prospect of sharing their adventures with the world enhances their FM-playing experience, as they relive the great moments of their managerial career through this forum board. These moments are made eternal memories here, and many writers can look back at their FM adventures with great pride when they read back over their story. Others purely enjoy telling stories. These born story tellers may even enjoy captivating their audience on fmscout.com more than playing the game itself. With a high number of writing styles available to all users here, there are certainly several ways to tell your tale. Your story is also a way to interact with other FMers and discuss your save game in detail. For people looking for advice, or for opinions, regarding their save, writing a story is certainly a way of explaining their current situation in-game, and to enquire for assistance. To begin your great tale of FM, simply click on the big red button captioned "Start New Topic" at the top of the Football Manager 2019 Stories forum. From there, you can select an appropriate title for your story, a brief (preferably one sentence) description (optional), an avatar which will be displayed alongside your story in the forum (also optional), and an introductory first post to the story. You may also add a poll to your topic here (optional, once again). Once you have created your story and clicked "Submit", you can then produce further posts by commenting on the topic itself. In the provided text-box for writing posts, there are a number of bbcode shortcuts. These bbcodes will enhance the graphical representation of your story, and many experienced writers have become well versed in how to code their posts. To find a full set of bbcodes, and how to use them, please look at the bbcodes and re-usable icons topic provided by Stam, the founder of this site. You can find a well-written guide on how to upload and post picture to this site here: How to post pictures on the forum. What Style Should I Write My Story In? There are an infinite number of writing styles which can be used to share your FM adventure with the world. We will have a look at the styles mainly used and describe how and why they are used. Monthly/Seasonly Reports: For those simply looking to share their achievements in FM in an organised and regular manner, a report of each in-game month, or season, would be suitable. With this style, you can describe, in as much as detail as you wish, the business of your manager and his team over the course of a month, a season, or any time frame. Information shared in this style is usually relevant to your save, but does not necessarily have to be. News Articles: A number of writers enjoy discussing key events in their save in a third-person format, as seen on media platforms. The benefit of this style of writing is that you can make an unbiased description of events which occurred in your game, while also being able to discuss fictional events which occur in the tale which you are telling. As is with reports, there is much flexibility as to what and how you can use articles, you only need to use creativity. Narratives: Another popular way to share your story is by narrative. This is, in essence, true story telling, as you discuss, in as much detail as you wish, the adventure of your manager. You can write as your manager, or as an outsider, but it is truly an in-depth recount of his/her story. The possibilities with narratives are endless. As I said before, there are countless ways to write your story, and it is worth considering how you wish to write yours in advance. You do not need to stick to one style throughout the entirity of your story, and you can certainly experiment different styles throughout, but I do advise that you keep your story somewhat clear and easy to follow. Too big a contrast in styles in little time could confuse readers. A large part of writing stories here is the community interaction. Any member can get involved in the comments section of a posted topic. As a long-term member of this community, I can only ask that any community interaction made is of a pleasant and socially-acceptable nature. As a long-term writer here, I ask that any interaction made regarding your story, or anybody else's story, is purely constructive and of encouragement, as a lot of effort may be put in to story writing. If you are reading another person's story and feel they deserve encouragement or praise, or you have a question to ask, feel free to comment your opinion. These forum boards are perfect for those looking to discuss their FM stories with one-another, and commenting on each other's stories is a perfect way of doing so. There are also regular awards given for story writing here. A Story of the Month award is given to the best-written story, as decided by the community through a poll, of the month. For the more consistent and long-term stories, a Story of the Year award is also dished out, as decided by the community. While there are no physical rewards for winning such accolades, they are certainly nice pieces of recognition for hard work and good writing skills. While FM stories have quietened down, in general, in recent months, due to the FM16 season drawing to a close, a vibrant burst of new stories can be expected to appear in the coming months with FM17's release just around the corner. Everybody here at fmscout.com looks forward to reading new and exciting adventures, and we hope to see many new writers trying their hand at sharing their adventures. If you have any questions regarding story writing, feel free to ask in the comments below, or contact any member here who you feel can offer your relevant advice. Great article Justice. By the way, who made the header image? 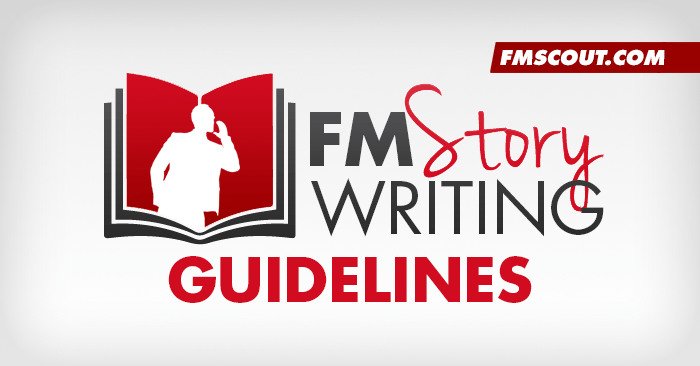 You are reading "FM Story Writing Guidelines".